Since Gossip Girl is my favorite show ever, I will talk about Gossip Girl fashion once in a while. There are many people who watch the show, and are of course madly in love with the characters' style, so today I'm going to talk about Serena Van Der Woodsen's style! Her style on the show is said to be inspired by Kate Moss. Which means that she mixes fashion-forward and vintage pieces together for a "boho-chic" kind of look with a rocker-chick edge. Serena is never afraid to wear something crazy if she's in love with it and she make it look effortlessly fabulous. She will never leave the house without putting her own touch on her outfit. Of course, her style is also inspired by the Upper East Side, this means that there's always an element of classic chic in her outfit. Most of the clothes she wears, cost hundreds of euros and made in luxurious fabrics. If you want to dress like Serena, there are a couple of key pieces that you'll want to make sure you have in your wardrobe. Serena almost always wears a jacket! She might need it of course in the winter in Manhatten, but they're still one of her signature looks! She has quite a collection of every type of jacket: long, short, cropped, leather, wool and just everything in between! She wears them in every color, too: bright colors (like red or gold), muted shades (like grey) and earth tones (like camel and brown). If you want to wear a jacket like Serena does, the cut is everything! A jacket that fits you perfectly is a wardrobe goldmine! You can wear it with everything and it will upgrade your outfit! A way to make sure that your jacket fits perfectly, is to bring it to a tailor. It won't cost you much money to have seams taken in or let out, but it will pay off in the long run! To find great jackets, you can check out Ebay, vintage stores (because many of Serena's jackets are vintage) or H&M (they're known for cute jackets, I own a couple of them), then call up a tailor so it fits you right! 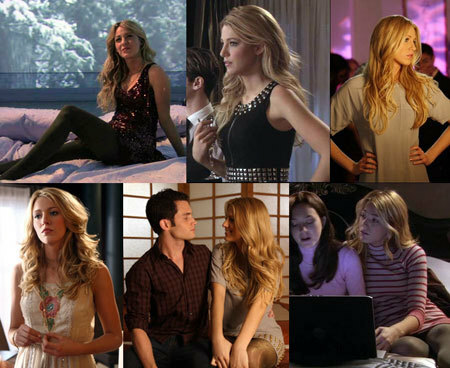 Skinny jeans: Serena wore them in many episodes! Even though there will be many wider legs and boot-cuts in the racks again, Serena's denim of choice are still the skinny jeans! So if you have great legs like Blake Lively, show them off in a pair of skinny jeans before they go out of style! On the show, Serena wears the brand Seven for All Mankind, but if you want to go cheaper, stores like Forever 21 and Wet Seal sell quality skinny jeans for just a fraction of the price. Then Serena still that girly side to her, so we've also seen many dresses on her! She always wears the kind that have unexpected details to express her quirky style. For example, take the gray t-shirt dress that Serena wore to Blairs birthday party (the one on the picture below on the right). The top half resembles a plain men's shirt, but when you look down at the hem, there are gold studs all around the bottom. Paired with sparkly black and gold tights, the look was casual yet funky at the same time! To get this look, try to find dresses that have something unexpected about them, such as: studs, sequins, patterns or a pretty design. Serena usually wears mini dresses, so if you have the legs for it (like she does.. *sigh*), wear one with some black or sparkly tights and fabulous shoes! Great places to find amazing dresses that don't cost you a fortune: H&M, Bluefly, Charlotte Russe and Forever 21. Serena's look may be simple sometimes, she may just throw on a t-shirt and skinny jeans, but it's all about the details. She'll make the outfit fashion-forward and unique by just adding some accessories. Boots: She just wears them all the time! She combines them with skinnies, tees, dresses, and even her school uniform. Layered Necklaces: Serena has lots of necklaces, they are usually long, hitting above her belly button, and she layers them for a bohemian look. If you want to find unique, fabulous necklaces at low prices, Etsy may be a great website to search on, Ebay and H&M! Bangles: She doesn't wear them all the time, but when she does, she uses them to add interest to her simpler outfits. You can find great inexpensive bangles at Charlotte Russe, Wet Seal, H&M. Then of course, there's her hair. It's just always perfect! It's her signature look. Blake Lively wears extensions on the show to get her hair super long, so if yours isn't that long, try clip-in hair extensions to get the same look. If you already have long hair, it will be easier for you to get Serena's hairstyle! To get waves like Serena's, work mousse trough damp hair and blow dry while scrunching to bring out your hair's natural wave. Next, take a curling iron and curl your hair in sections, starting with the bottom layers and working your way up your head. Don't worry about getting it perfect, because Serena's hair never is perfect, that's just it. And that's okay! Finish you hair with light hold hairspray, tousle and go! Try to add a cute head scarf like Serena on the photo below for extra credits! Hello Sweetheart! I have just nominated your blog for the Liebster Award. I believe your blog is wonderful and you deserve a solid support and recognition from others!!! Keep up doing great work!!! Wow I thank you so much for this! This really means a lot to me, even the fact that I just started this blog while it means the world to me, since blogging is all I love to do, it's just.. You're the best!